Learn some interesting information about Madagascar while enjoying a range of fun facts and trivia that's perfect for kids! Read about the unique ecology of Madagascar, its languages, economy, capital city, popular pastimes and much more. 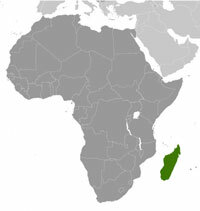 The official name of Madagascar is the Republic of Madagascar. Madagascar is an island country, off the east coast of Africa in the Indian Ocean. From 1895 France governed Madagascar. In 1960, the country became a fully independent country called the Malagasy Republic. It became the Democratic Republic of Madagascar in 1975 and the Republic of Madagascar in 1993. The capital of Madagascar is Antananarivo, home to over 2 million people. Madagascar is home to over 22 million people (22,599,098) as of July 2013. The highest mountain in Madagascar is Maromokotro at 2876 m (9436 ft). The lemur is only found in the wild in Madagascar. As of 2012, there were 103 living species of lemur in Madagascar, including sub-species. The majority of these are classified as rare or endangered. Several species of lemur such as the giant lemur have become extinct in the past, mainly due to extensive deforestation. The unique ecology of Madagascar has led some scientists to refer to the country as the "eighth continent" of the world. Madagascar is one of the world’s main suppliers of vanilla and cloves, while coffee, lychees and shrimp are also important agriculturally. The country currently provides half of the world's supply of sapphires and produces a number of other precious and semi-precious stones. Madagascar is a relatively poor country with approximately 70 percent of the population living below the national poverty line threshold of $1 per day. The national sport of Madagascar is rugby, with football (soccer) also popular. For more information, check out maps of Madagascar or take a closer look at the Madagascan flag.